If college applications start to stress you out, just think of these two words: College tour. Seriously, this is the fun part. For starters — road trip! But also, it’s a preview into the life you will be living this time next year. And while it may seem like you’re a slave to your college essays and SAT scores at the moment, college tours are an important part of the process. This is where you get to decide if you want them. 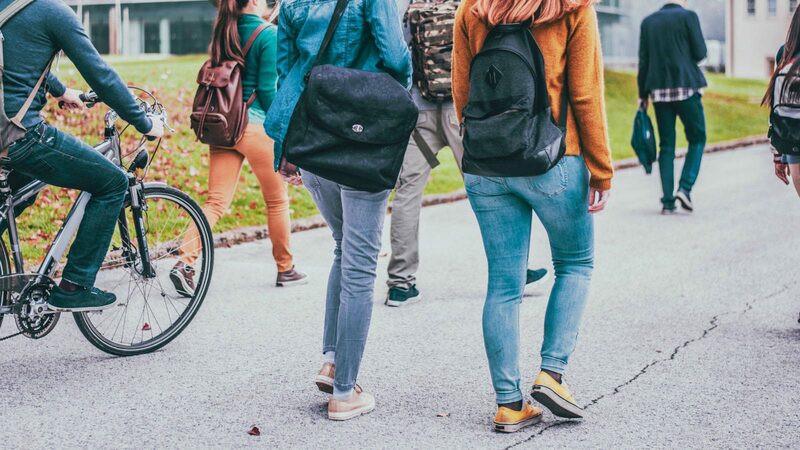 So make the most of these visits and, if you really want a taste of what the next four years will be like, explore the real student experience through these suggested avenues, which give a fuller picture to anything you’ll find on a college tour. Almost every school has a Facebook group (or more than one) where students can share stories and discuss what’s happening on campus. Do a quick search for the name of the school in Groups, or add the intended graduation year to look for more specific ones. Though these groups are usually closed, you can reach out to the admins (that information is public) and explain that you’re just looking to get a sense of the school. This is a great way to glimpse the student culture, and whether you’d be a fit. You could even reach out to existing students for a broad picture of what campus life is like — just be sure to be respectful, and follow any community guidelines. My program has an unofficial Facebook group where students share resources, ask for advice on instructors, give tips on scholarships and commiserate. “In my case, my program has an unofficial Facebook group where students share resources, ask for advice on instructors, give tips on scholarships and commiserate,” says Selena Hoy, a graduate student at Portland State University. This group is “much more raw” than official pages, she says. Google the school you’re interested in. Then go a step further and start scoping out the blogosphere — lots of students blog about their school and campus life. There are even Slack channels for many university departments. For female students specifically, Her Campus is a great site to follow. You can search for your prospective school and read what’s happening on campus. Plus it’s augmented with female-focused articles. Getting these unfiltered views “is important so that new students can go in forewarned and forearmed about the potential pitfalls of the programs,” Hoy says. It’s also a great way to scope out the best each college has to offer, from the most inspiring professors, to the best late-night snack spot. Messaging platforms Yik Yak and Yeti are no more, which means that college students are turning to Snapchat in droves. According to the most recent ComScore numbers, 45 percent of Snapchat’s users are between 18–24. The increase in Snap users is a boon to prospective students, who can troll the app to find campus culture shots of their potential schools. The best time to look is on Friday and Saturday when usage among college students spikes. And with Snap’s new Snap Map feature, it’s easier than ever to find nearby snaps on the app — just pinch out from the main screen and you’ll see what people are doing nearby. Sure, you can follow a potential school’s Instagram feed, but look a little deeper into the geotags on the app, and you’ll find a treasure trove of off-tour info about the school. If a college has included its location in the post, you can click on the location link and see posts from anyone on campus. It’s an insta-view into the campus culture. Another option is to just search for the school and click on the Tags or Places menu, where you’ll again be able to see what actual students and people in the area are doing. What’s the problem with scheduled school tours? They can happen when class isn’t in session. While that’s great for getting the lay of the land and seeing campus, it’s terrible for seeing how students interact with one another and with professors. If possible, try to set up an overnight stay, either by getting suggestions from the school or by getting recommendations from a Facebook group or from others you meet on campus. That way you can get a taste of the school’s social life and dorm living. Schindler has friends involved in the athletic programs at Brandeis who shadowed a student for a day and stayed the night. She recommends it as a way to see how you’d fit into the community on campus. Remember, college is going to be your home away from home for the next four years, so it pays to spend an extra hour or two investigating. So channel that inner sleuth and get the skinny on your future alma mater. No disguise required.